Since 2006, CedarStone Bank and McGavock High School have teamed up to recognize students who meet and exceed their school responsibilities, and who distinguish themselves as good citizens and students in our community. Recently CedarStone Bank presented Student of the Month honors to Hannah Richardson (pictured in left photo) and James Phillips (pictured in right photo). For the first time since 1856, the vast majority of the land U.S. President Andrew Jackson owned at the time of his death will be under one ownership, that of the Andrew Jackson Foundation.The Board of Trustees of the Andrew Jackson Foundation held its regularly scheduled fall meeting on Friday, October 26 on the grounds of The Hermitage. At the conclusion of the meeting, Governor Bill Haslam joined the board for an historic event. The State of Tennessee has owned approximately 460 acres of land formerly owned by Andrew Jackson. Governor Haslam delivered to current Regent Bob McDonald and Frances Spradley, immediate past Regent, a quitclaim deed, transferring owner ship of the property to the Andrew Jackson Foundation. 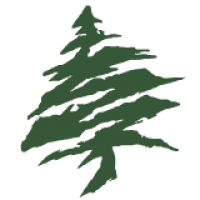 In addressing Governor Haslam, Bob McDonald, president and CEO of Lebanon based CedarStone Bank, expressed appreciation to the governor and committed to preserving the legacy and protecting the land of Andrew Jackson with the same determination as the state. “Thank you for placing trust in the foundation with the gift of this land, and we know that with that trust comes responsibility. We take this responsibility very seriously and we will protect the land and legacy of Andrew Jackson with great diligence,” McDonald said. He continued, “just as your predecessors, you will be forever remembered and revered for your action today”. Governor Haslam’s action is consistent with that of other Tennessee governors in the protection of Andrew Jackson’s land and mansion. Upon the death of Andrew Jackson in 1845, his son lived in the property until 1856, at which time he decided to sell the plantation to pay off debts. He sold half the land to a private party and the mansion and the other half of the land to the State of Tennessee. Governor Andrew Johnson had the vision of purchasing the property to preserve Jackson’s land and legacy. In 1972, Governor Winfield Dunn purchased the other half of the land from a private party to keep it from commercial development. In 1991, Governor Ned McWherter deeded the mansion and half the land to the Ladies’ Hermitage Association, now the Andrew Jackson Foundation. And now with his action, Governor Haslam has deeded the remaining half of the land. Andrew Jackson’s Hermitage: Home of the People’s President is one of the largest, most well preserved and most visited presidential homes in the United States. Opened to the public in 1889, The Hermitage is one of America’s first presidential museums. Today, The Hermitage is a 1,120-acre National Historic Landmark with 27 historic buildings, including Jackson’s mansion and tomb, restored slave cabins, a church, and gardens. In recent years, new interpretive initiatives and educational programs such as on the history of slavery have enhanced the experience of the 228,157 visitors in FY 2018. For more information, visit www.thehermitage.com. Recently CedarStone Bank presented “Student of the Month for August 2018” honors to Fontesheia Lewis. The staff of the Donelson Office participated in the presentation. Seated left to right, first row is: Norene Hubbeling, Ashlynn Sheppard, Honoree Fontesheia Lewis, Willie McDonald and back row is, Robert McDonald and Mariciel Torrella. On Wednesday, May 16th, Andrew Jackson’s Hermitage hosted its 118th annual Spring Outing. Light lunch and champagne were served to the 400 guests in attendance including Bob McDonald, Vice Regent of The Andrew Jackson Foundation. The featured keynote speaker was former ABC White House correspondent Anne Compton, a broadcasting veteran and the first woman assigned to cover the White House on a full time basis by a network television news organization. Compton captivated the audience with her stories of covering administrations dating back to President Gerald Ford, and brought awareness to the Andrew Jackson Foundation. The foundation, which teaches American history in classrooms, on site, and through web conferences across the nation, continues its outstanding preservation of The Hermitage, a National Historic Landmark. For 20 years now, CedarStone Bank has been proud to co-sponsor the Wilson County Teacher of the Year celebration and to support education in Wilson County. Tracy Brown, an English as a Second Language Teacher at Mt. Juliet Elementary School, was recognized alongside 31 of her colleagues for their excellence in teaching. Congratulations to everyone involved! 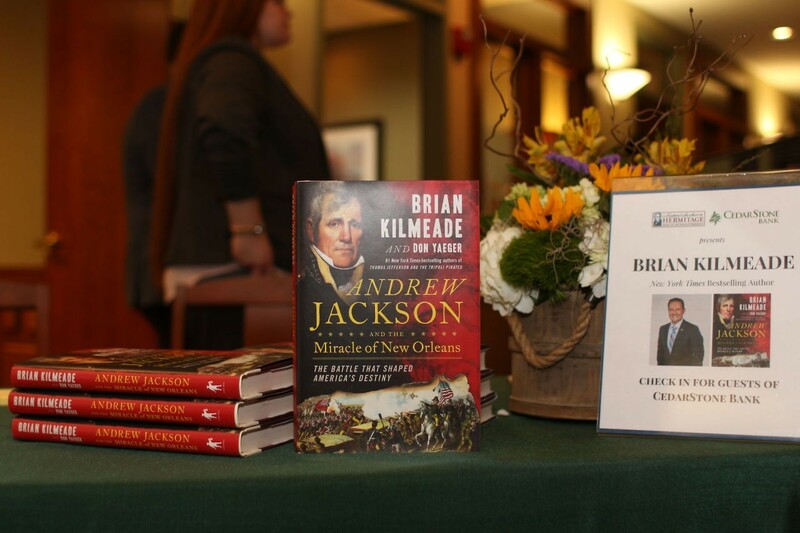 CedarStone Bank co-sponsored an event Sunday, January 7 with Andrew Jackson’s The Hermitage in hosting FOX News Personality Brian Kilmeade, co-author of "Andrew Jackson, and the Miracle of the Battle of New Orleans." The meet and greet book signing was held at the Lebanon Main Office of CedarStone Bank. Kilmeade co-authored, "Andrew Jackson, and the Miracle of New Orleans", an Amazon number one best seller. The book is an indepth look at the Battle of New Orleans as Andrew Jackson convinces President Madison and his War Department of the importance of winning the battle against British forces. Guests included friends, customers, shareholders of CedarStone Bank, local dignitaries and friends and patrons of The Hermitage, Home of Andrew Jackson. CedarStone Bank supports events as well as the vision of Andrew Jackson’s Hermitage and considers the mansion a special and unique historical site in the market the bank serves. CedarStone Bank plans on the bank closing this coming Monday for one hour so that employees and customers may enjoy the upcoming solar eclipse. “We will lock our doors from 1:00 to 2:00 p.m. in preparation for the total solar eclipse on Monday, August 21,” explained John B. Bryan, CedarStone Bank VP and Director of Marketing. The bank has a limited supply of eclipse eyewear and official “CedarStone Bank Eclipse” tee-shirts available for customers. The souvenir items will be available to bank customers on a first come, first served basis. “We thought it would be a neat idea to give our customers a memento of the total solar eclipse. These things don’t happen very often and we believe our customers and employees will enjoy this brief moment in history,” Bryan added. Bank operations will resume immediately at 2 p.m. and will close at regular business hours on that day. Photo Caption (above) - A number of Wilson County residents attended President Donald J. Trump’s visit to historic Andrew Jackson’s home, The Hermitage, last Wednesday. Those pictured are from left, Wilson County Mayor Randall Hutto and wife Paula, State Rep. Susan Lynn, Andrew Jackson, VI, General Sessions Judge, Knox County (great-great- great-grandson of Pres. 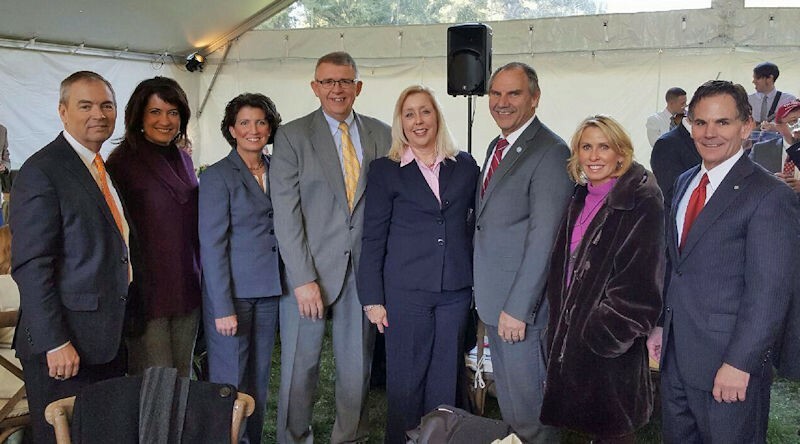 Andrew Jackson) and his wife, Janet, State Rep. Mark Pody, Susan McDonald and her husband Bob McDonald, CedarStone Bank President and Vice-Regent of the Board of Trust of the Andrew Jackson Foundation. Upon his arrival to Nashville last week one of President Donald J. Trump’s first stops was at President Andrew Jackson’s home, The Hermitage. Some 400 invitees and friends and supporters of the Hermitage were on hand as the President paid respect to Jackson’s grave site and toured the mansion of the 7th President of the United States. A number of Wilson County residents attended the event as part of the 250th anniversary celebration of Jackson’s birth (March 15, 1767). The Hermitage will be hosting several events throughout 2017 as they celebrate this momentous occasion. Those attending from Wilson County included Wilson County Mayor Randall Hutto and wife Paula, State Rep. Susan Lynn, State Rep. Mark Pody, CedarStone Bank President Bob McDonald and his wife Susan. McDonald also serves as Vice-Regent of the Board of Trust of the Andrew Jackson Foundation. The Tennessee General Assembly has for many years been a very important and special supporter of Andrew Jackson’s Hermitage. Over the course of many years legislation has been passed that resulted in the Hermitage receiving financial support from the state for important maintenance issues of the historic mansion. “The Andrew Jackson foundation has been the beneficially for many years of financial support of the Tennessee General assembly and our local delegation made of Mark Pody, Mae Beavers and Susan Lynn have played a key role in that support as they have embraced this effort in the ongoing preservation of this historic landmark,” commented McDonald on behalf of the Board of Trust of the Andrew Jackson Foundation. Also in attendance were Andrew Jackson, VI and his wife Janet. Jackson is the great-great-great grandson of President Jackson and serves a General Sessions Judge in Knox County, Tennessee. Judge Jackson and his family are also great supporters of the Hermitage and are very proud of their heritage. They regularly attend many activities and events at Andrew Jackson’s Hermitage. CedarStone Bank customers will be excited to learn that our new “chip” debit cards will be mailed out on February 14, 2017. “Customers will need to activate their new card by March 27, 2017. Instructions will be included in the envelope with the new debit card,” explained Kristin Howard, AVP, BSA/Deposit Services Manager. It’s important to note the card number and pin number for your debit card will not change. A direct mail piece will be mailed out the week before the card arrives as a gentle reminder of what is to follow. If you have any questions or concerns, please feel free to call your local CedarStone Bank office or as always, call the main office at (615)443-1411.